The Three Rs: Rants, Raves and (Occasional) Reflections: Where Were You When the Sun Went AWOL? If you weren't aware of yesterday's total solar eclipse, you weren't on this planet. Okay, maybe that's stretching it a bit, but only a bit. It was a big deal here, because we were "in the path of totality," as it was billed. We had the Official (TV) Station of the Eclipse, and all kinds of other "official" things. Who knew the sun and the moon could hire a PR firm to promote their brief encounter? Not that it was needed. The excitement that grew in anticipation for this once-in-a-lifetime event had been building for months. On the Big Day, thousands of people made the trip to our area just to see it. Some came from as far away as Japan and China. Some booked flights just to be in the air as it happened. 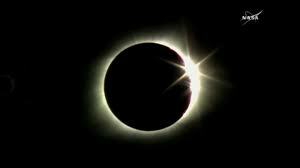 Some got engaged during the Moment (totality, when the sun's corona looked very much like a celestial diamond ring). Ten babies were born during the eclipse--an unusually high number, according to doctors. A black foal born during the eclipse had a crescent-shaped white mark on its head. Guess what she was named? For one day, most of us put aside our differences, joined in our excitement over seeing something that, if you're lucky, you get to see once in your lifetime. Eclipses weren't always so popular, however. Some ancient cultures believed the sun might disappear forever and demons would descend upon the earth and devour humans. Some fasted, believing food cooked during an eclipse was impure. Some ancient superstitions told of children born during eclipses turning into mice. Others suggested women and children were at risk and had to stay indoors.Some saw it as a warning to settle differences, as the sun would not come back until they did so. Good thing that one's not true. We'd still be waiting for the sun to come back! In movies, eclipses have been harbingers of doom. 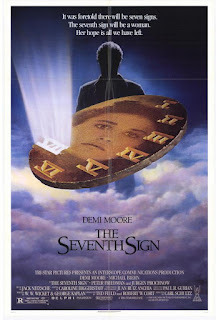 In The Seventh Sign, an eclipse was one of the signs preceding the end of the world. I viewed the eclipse with a neighbor, right here in our courtyard. I almost didn't go outside, even though I had my eclipse glasses ready to go. One of our local TV stations was doing a three-hour special to cover it. It would be more impressive on TV, I told myself. The image would be larger. More detailed. It wouldn't look any different. I did venture out, at first, just to see how tiny the sun looked through the glasses at the beginning. There was just a small part of the sun obscured by the moon. Made me wish I still had my telescope. Made me wish for another. Made me wish I had brought my tablet out so I could view it through the Mobile Observatory app. I decided I wanted to see the big finale. I watched through the eclipse glasses as the sun was reduced to a tiny orange sliver, then nothing. I'd forgotten the part about removing the glasses when totality was reached. I pulled the glasses off--and was immediately speechless. It was the most amazing thing I had ever seen. I was wrong--seeing it on TV would not have been the same. Collin wanted to photograph it. I advised him to forget about that and just enjoy it. There would be plenty of photos available afterward. There have been--including a couple of amazing shots now available for viewing at St. Louis Daily Photo. For once, Collin took my advice and is still taking about the experience. Things were busy at IHOP, he said, until about 11:45. There was a viewing party at Jefferson Barracks, so I'm guessing everyone headed over there to wait for the eclipse. It was so quiet at the restaurant, Collin and his fellow servers were able to go outside and see it themselves. It's great that the weather behaved and you got good viewing conditions for it! It was partial up here, but also clear skies. It's worth seeing, at least once. I think the next one is supposed to come north through Mexico, the US, and eastern Canada. It was a typical sunny hot day here ! We only had a partial but it was so much fun. I enjoyed every second of it but came inside, to hot. I loved looking at the shadows, all the crescent leaves and shadows on the wall. I had some eclipse sunglasses for you but didn't get your goodie box shipped in time. Maybe I'll leave them in the box for the next one! I figure I don't have that many years left--I might not be here for the next one! You're right Norma, there is a new baby white koala, in the Queensland Zoo, soooo cute! I saw the video! Has she been given a name yet? I heard another popular suggestion was Elsa (from Frozen). Just Googled to see if they had named the baby white koala yet.. can't see a name anywhere, wonder how long it will take :) How are you feeling these days Norma, are you missing Collin now that he's not working at home anymore? If you hear anything more on the baby koala, please let me know. We were in town, at the county building, and our boss (County Forest Preserve Superintendant) was there with others and they had glasses. We got to see the beginning of it, but when we got home,it had become cloudy. But we had a lot of people in the park. I watched it on TV. We didn't get the darkness like others experienced. But I did see, when the sun was being blocked out, at one point, the odd look of the shadows on the ground. I remember that from other eclipses. You were in the area of totality, then? It was pretty amazing. The outside light was very eerie here. Glad you enjoyed it! It was like that here, too. Did you see the shadow bands? I did not. I am sorry to admit I watched it on TV. I witnessed this moment in time in Sunny Grand Junction Colorado. Rode an emotional roller coaster all day long. So did we. It's hard to describe the feeling! Too often, everybody gets caught up in getting a social media post that they miss the pure enjoyment of the moment. I told him there would be photos online, that he should just experience what could be a once in a lifetime event. He still talks about it.